All manufacturers to produce food additives are safe? 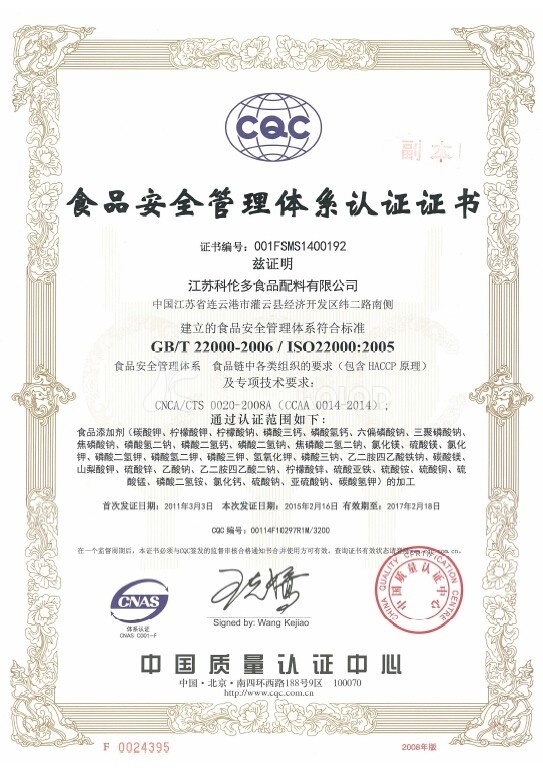 | Jiangsu Kolod Food Ingredients Co.,Ltd. HOME > News > Industrynews > All manufacturers to produce food additives are safe? All manufacturers to produce food additives are safe? Reporters from the State Food and drug administration official website was informed that in 2014 third phase second batch sampling of food safety, the State Food and Drug Administration on food additives conducted a special inspection, including gelatin, mixed flour improver and other compound food additives, savory flavor, food flavor and other flavors. Sampling projects include heavy metals, quality indicators, microbial indicators, such as 18 indicators, a total of 813 batches of 288 companies sampling products. Sampling results show that the blue Pu Rubber Industry Co., Ltd. produced by the blue Pu brand gelatin in excess ash content. In addition, Qingyuan City area and fresh food materials Limited production of “Heng” brand gelatin two batches of products were not qualified. Sampling based on “national food safety standards of food additives gelatin” (GB 6783-2013), “food additive gelatin” (GB 6783-1994), “the national food safety standards of food additives mixed general” (GB 26687-2011), “the national food safety standards of food additives composite leavening agent” (GB 25591-2010), “the national food safety standards of food flavor” (GB 30616-2014), “flavor” (QB/T 1505-2007), “the savory flavor” (QB/T 2640-2004) and “food additives” (GB 10355-2006) emulsified flavor such as standard and product standard and index requirement express. It is reported that, in the food safety supervision and inspection, the State Food and drug administration has inspection including food and food products, edible oils and fats and their products, meat and meat products, eggs and egg products, dairy products, wine, food baking, food products, candy and nuts roasted seeds and nuts and cocoa products, condiments, beverages 23 kinds of food 21188 batches of samples. Mr Li is a loyal fan of Yili bread, a little good “this one”. But recently he has no intention of finding that the shelf life of their often bought fruit bread becomes longer. “Room temperature preservation, 1, 4 quarter 12 days, 2, 3 quarter 8 days.” See the familiar yellow and white stripes on the packaging bags on the shelf life of the note, he did not dare to believe his eyes. At the same time buy back Steamed Buns fengzeyuan grabbed a contrast, the short shelf life of many: under normal temperature 1, the 4 quarter of 3 days, 2 days, the 3 quarter of 2. “Impression, bread shelf life is generally should be 4 to 6 days ah?” Face significantly longer shelf life, Mr. Lee did not rest assured. Jiangsu Kelunduo food ingredients Co., Ltd. is a medium-sized private enterprises in the production of food grade potassium chloride, potassium citrate, potassium hydrogen phosphate, two magnesium phosphate, pyrophosphate, acetate, citrate, food grade potassium acetate, potassium acetate and mineral elements of iron, zinc, magnesium, manganese, copper etc. the lord.